Share the post "Akebia Quinata Or Chocolate Vine: Growing Tips"
Akebia quinata, commonly known as Chocolate Vine or Five-Leaf Akebia, is a fast-growing, semi-evergreen twining vine that is classed as a noxious weed in many areas. It can twine up everything and anything: a structure, shrub, or tree. Some call this vine highly aggressive and extremely hard to eradicate. Akebia quinata is listed in the National Pest Plant Accord list which identifies pest plants that are prohibited from sale, commercial propagation and distribution across New Zealand. But there are also gardeners, who has no problem with this plant and happy with its beautiful little blooms, edible fruits and call this vine “delightful climbers to add summer shade”. Really, which vine can boast pest-free adaptability, rapid growth, beautiful, fragrant flowers, lovely foliage, and fascinatingly dramatic, edible-fleshed fruit? So please, don’t stop reading about this plant as it has many interesting features. Five-Leaf Akebia has compound leaves with five leaflets, so you can see where it has got its name. 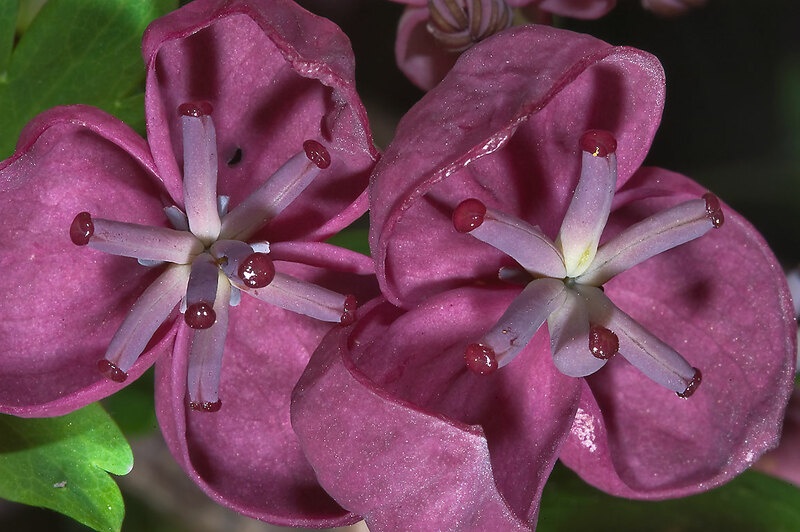 The flowers are clustered in racemes and are chocolate-scented, with three or four sepals. The fruits are sausage-shaped pods which contain edible pulp. The gelatinous placentation is littered with seeds but have a sweet flavor, so they used to be enjoyed by children playing out in the countryside in the olden days in Japan. This mild, viscous pulp is eaten raw with lemon juice or pureed and made into a cream or a drink. It has a slight coconut milk flavor. The fruit is also used to make wine. The rind, with a slight bitter taste, is used as vegetable, for example it can be stuffed with ground meat and deep-fried. The flowers are also edible, and the Japanese make very elegant dishes with them, both salads and desserts. Young shoots are used in salads or for salt pickling. The leaves used as a tea substitute. Some people grind the leaves to a powder and sprinkle into meals, as it is said to be anti tumor and anti cancer. The seed oil is used as a vegetable oil and also was used to make soap. In fact the seeds are about 33% oil but on the bitter side. many people spit the seeds out, however, they are edible. Fruits of the Five-Leaf Akebia are high in protein. A 70-gram serving of the fruit has 57 calories and 46mg of vitamin C. Akebi is also now cultivated as a crop in Japan providing a steady seasonal market. So, if after reading everytihng you decide to grow the Chocolate Vine, remember, that you will need two different varieties for cross pollination if you want to have fruits. By the way, he vines turn semi woody and are very good material for basket weaving. Medicinal uses: In China it is believed that Akebia quinata has diuretic, antiphlogistic, galactagogue and analgesic properties. The principal use of the herb in China is as a traditional remedy for insufficient lactation in nursing mothers. The medicinal part of the plant is the woody stem which is sliced in transverse sections and prepared as a decoction. The stem contains approximately 30% potassium salts thus giving the diuretic action. Cultivars: ‘Alba’ and ‘Shirobana’ are white-flowered and white-fruited forms with lighter green leaves and slightly less vigorous growth rates than their darker cousin. ‘Alba’ is slightly more evergreen in nature and blooms a bit earlier with more fragrance. ‘Rosea’ has light magenta or lavender flowers, almost as if it had faded to a more delicate tint than the species, and ‘Variegata’ has white variegated foliage. Tips: This plant can be invasive and hard to eradicate. It doesn’t mind severe prunning. Once established needs some control. If the fruit is allowed to ripen and cast seeds, they sprout all over the place. Do you grow Akebia Quinata (Chocolate Vine) in your garden? What is your experience with this plant? Please share with other fellow gardeners in the comments below! 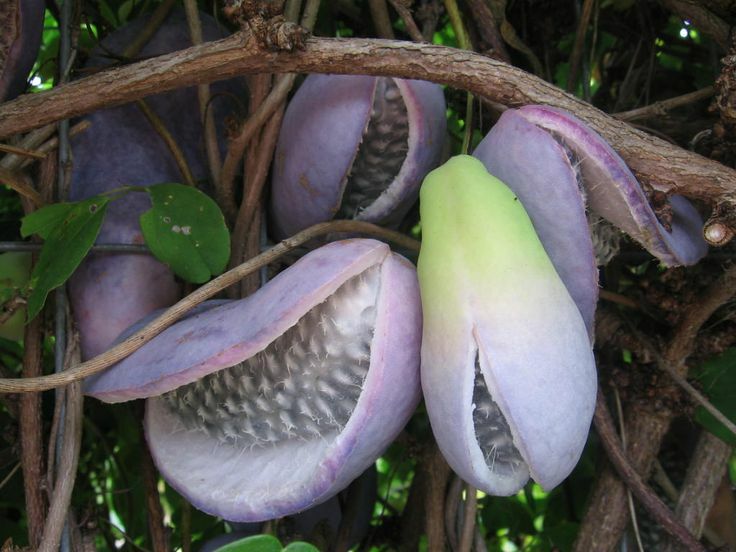 Do you sell Akebia Quinata (Chocolate Vine) seeds or have plants for sale? You can place your advertisement here. Contact us now!